As many of you know, I spent some time at the end of July and beginning of August dress shopping and found two potential contenders, but none that gave me that “this-is-the-one” feeling, so the search continues. Such a little sneak, she was looking through the desk drawers!!!!!!!!!!!!! Priscilla’s know how to treat their girls! I really enjoyed relaxing in this silky robe while my dress picks were gathered up by my lovely consultant, Patty. Chilling in my robe, waiting to try some dresses! 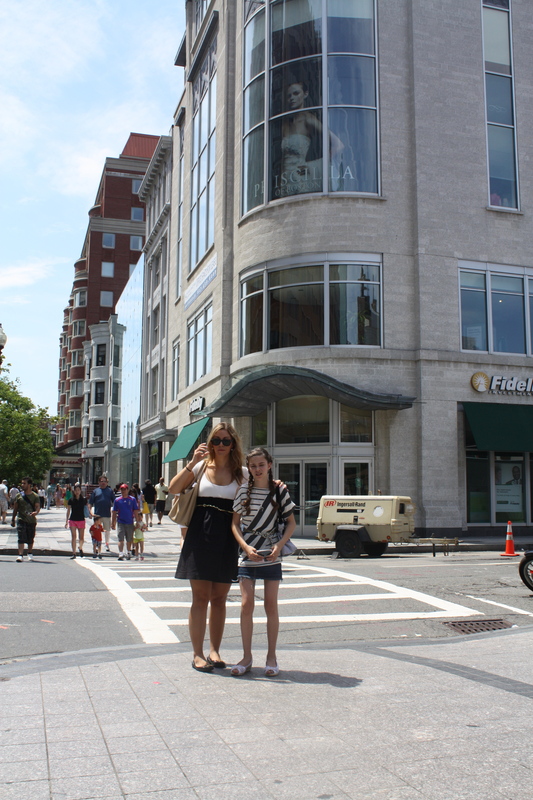 Celebrating a fun trip with some cupcakes at Sweet on Newbury St. I have to admit, trying dresses on is fun, so I can’t say I mind that the search is STILL on too, too much. My favorite part has definitely been honing on on my “wedding dress style” and looking to art and history for inspiration. 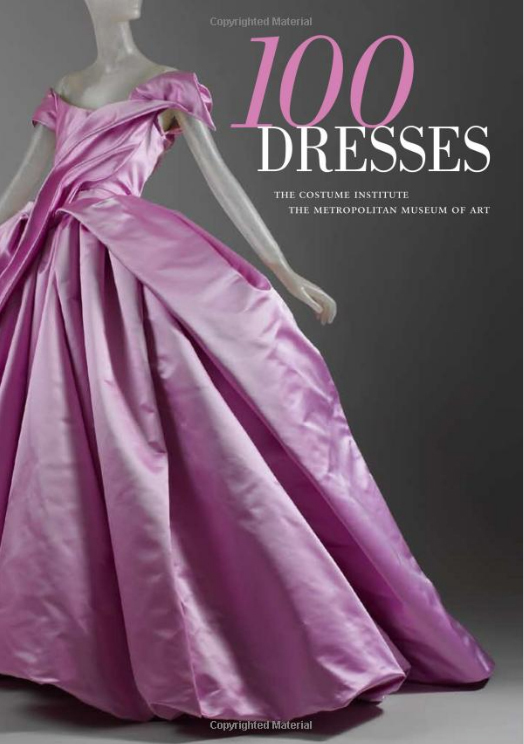 The book, 100 Dresses: The Costume Institute | The Metropolitan Museum of Art, has been my go-to lately for dress research, but I’ve also been looking at vintage ads and photos for inspiration. I think it’s interesting how both mannequin and model are posed so similarly in these big dresses, below. 1. Carolyn Bessett wore a gorgeous, modern silk crepe Narcisco Rodriquez gown that will probably look modern forever. 2. 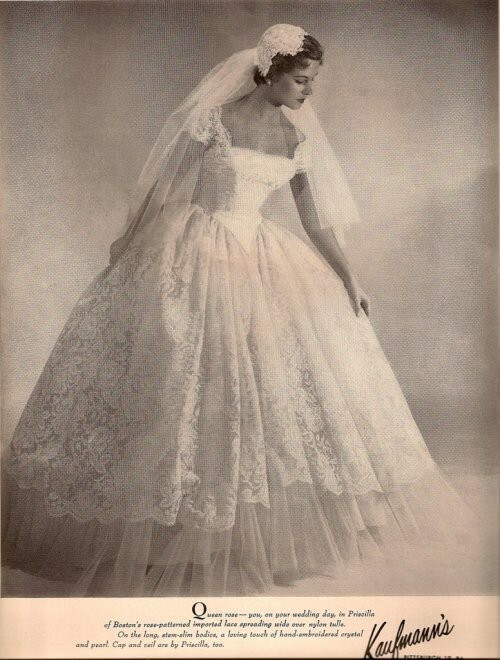 Grace Kelly wore a gown by MGM costumer Helen Rose when she wed Prince Rainer of Monaco in 1956. 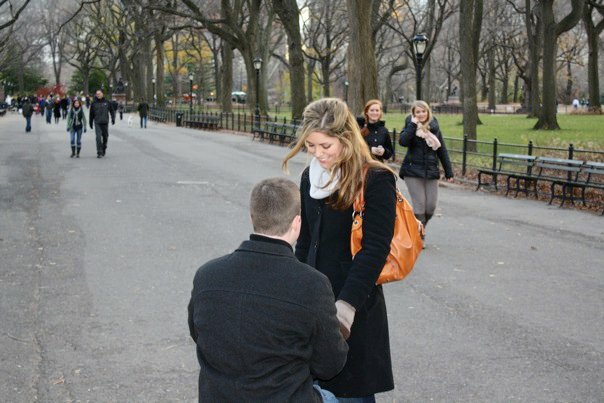 Clearly, Kate Middleton’s inspiration! 3. American divorcée Wallace Simpson wore a very modest, but elegant, Mainbocher number when she became the Duchess of Windsor in 1937. Look at the tailoring! I die.. seriously. 4. 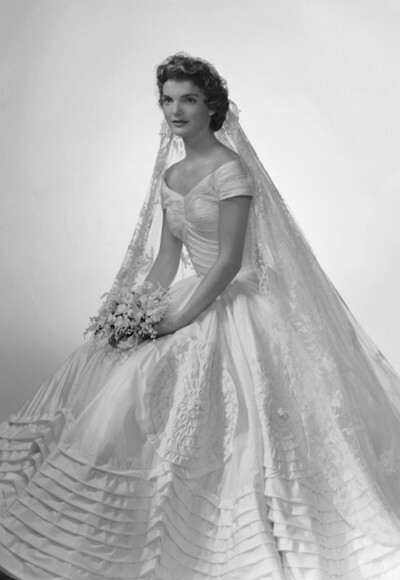 Jacqueline Bouvier wore an ivory silk taffeta gown with a portrait neckline and bouffant skirt decorated with interwoven bands of tucking, by Ann Lowe for her 1953 nuptials. You laugh, but embellished skirts are a huge trend and I BARELY resisted. Alyne’s “Wendy” gown was a serious contender. Eek! 5. Princess Diana wore a gown designed by David and Elizabeth Emanuel for her July 1981 wedding. Shudder. And finally, just a few of my more modern favorites. Gwen Stefani, Carrie Bradshaw (in the film), and Kate Moss each did bridal their own way and I think each dress is so perfectly “them” that the styles will transcend time. That’s really all you can hope for right? I still can’t watch the S&TC movie without tearing up when Carrie tries on this Vivienne Westwood dress (center, below). Not to mention: drool! Isn’t it gorgeous? Anyways, that’s where my head is lately on the dress front. I spent most of July/August focused on caterers and photographers, so I think my break is coming to an end soon. Stay tuned.